As much as it may pain us to say it ... LaVar Ball is right. This time at least. The Los Angeles Lakers pulled off an improbable 102-99 overtime victory over the previously undefeated Washington Wizards on national TV on Wednesday, after LaVar had guaranteed victory Sunday. "[The Wizards] better beware cause Lonzo ain't losing again," LaVar said. "Not in the same week!" 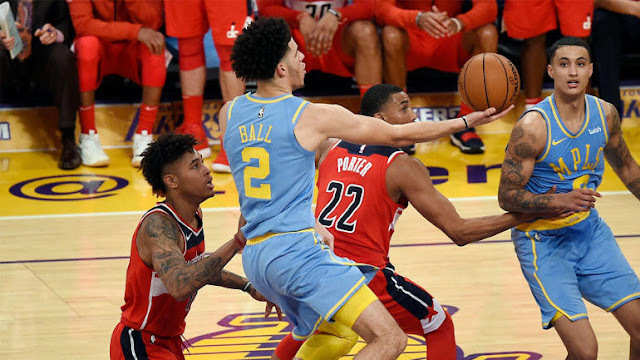 Wizards center Marcin Gortat was the first to chime in, responding that Wall would "torture" Lonzo Ball. Then Wall himself added that he would show "no mercy" to the rookie. But in the end, it was Ball and the Lakers who showed no mercy. On the surface it looks like Wall won the individual battle, but really only when it comes to points -- Wall had 18 to Lonzo's six. However, Ball bested Wall in every other significant category: 10 assists to nine, eight rebounds to three, one turnover to four. Ball finished the game at plus-13 while Wall was a minus-14. But there's really only one stat that matters -- wins -- and that was what LaVar harped on after the game.